The Parent Dashboard was launched in January 2018, after months of extensive input by parents and educators. Since its launch, the Dashboard has been viewed by over 1 million visitors. A Phase 2 release in January 2019 adds new metrics and enhancements! 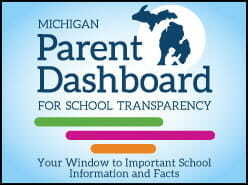 The Dashboard can be accessed from any computer or mobile device at www.MISchoolData.org/ParentDashboard. NEW! The Phase 2 release introduces information voluntarily submitted by schools that describe “School Services and Offerings.” This section adds nearly 20 new items describing such areas as a school’s array of course offerings, teacher qualifications, and services for special populations of students. The MDE has developed various communications tools to help schools, districts, and organizations discuss and share the dashboard with constituents, parents, and the community.